During a 78-minute stretch early Friday morning, the U.S. Senate rejected a last-chance health care bill known as skinny repeal 51-49. The vote, spurred by Majority Leader Mitch McConnell, broke the Republican Party’s seven-year promise to repeal the Affordable Care Act — Obamacare. Three Republicans joined with Democrats. The vote pronounced that all Americans deserve health care. Worry about administrative or legislative trickery taking away the protections of Obamacare will linger. Trump and those in his administration charged with operating Plan O must do the opposite. Their legal charge is to follow the requirements of the Affordable Care Act. As the president wrote on Twitter later Friday, “We will always ENFORCE our laws.” Obamacare counts. The same applies to Republicans in Congress who might be equally eager to ensure failure through nonfeasance. The government must enforce legal mandates for employers to provide health insurance and for individuals to obtain health insurance. Also, it must fund cost-sharing agreements. All are needed to keep the cost of coverage down. Meetings of the U.S. Senate are not the most physical gatherings. Nonetheless, three physical properties of Sen. John McCain made impressions during the Tuesday-through-Friday effort to eliminate Obamacare. McCain, R-Ariz., walked onto the Senate floor Tuesday to deliver a speech upon his return after surgery July 14 for a blood clot behind his skull and above his left eye. Stitches above his eye and bruises beneath marked the medical work. McCain’s raised-and-spread right hand, and his right thumb, would complete the visual memories by which many people will remember the week’s erratic effort to govern. In his speech, McCain said the Senate was not accomplishing anything and all of its members would have to work together if they hoped to succeed. McConnell countered cooperation by dishing out soggy bowls of his health care Alpha-Bits. Never mind that the senators had not supported Plan A, Plan B or Plan C the previous week. McConnell should have heeded McCain’s message. After all, five days after surgery, the Mayo Clinic said tests found that McCain has an aggressive type of brain cancer. If any senator was thinking deeply about health care, it was the 80-year-old Arizonan. With McConnell’s ABCs piling up, he switched to descriptive names Tuesday. The Senate voted down a new variation of the Republican bill, known as repeal and replace, 57-43. The bill included an amendment from Sen. Ted Cruz, R-Texas, to allow low-coverage, low-cost insurance plans that do not meet Obamacare standards. Wednesday, the Senate voted down partial repeal 55-45. The proposal would have removed the bulk of Obamacare after two years, allowing the Senate to write a new plan in the meantime. The same proposal was called Plan C the previous week. It would eliminate health insurance for 17 million people in 2018, compared to present, 27 million in 2020 and 32 million in 2026, estimated the nonpartisan Congressional Budget Office on June 19. Just after midnight on Friday, McConnell placed one more plan, known as skinny repeal, before the Senate. Skinny repeal would have removed the mandate for most people to have health insurance and it would have cut several lesser requirements. It would eliminate health insurance for 15 million people in 2018, compared to present, 15 million in 2020 and 16 million in 2026, estimated the CBO on Wednesday. Then McCain acts on his convictions. At 12:34 a.m., “McCain is in his seat and Alaska Sen. Lisa Murkowski, one of two Republicans expected to vote no, starts to talk. McCain makes a thumbs-down motion to Murkowski, but few notice it,” wrote Lisa Desjardins for the PBS NewsHour. At 1:16 a.m., after a series of discussions with senators of both parties, as well as Vice President Mike Pence, McCain leaves to take a phone call. At 1:28 a.m., McCain re-enters through a tall pair of wooden doors at the rear. He walks to a clerical desk on the Senate floor, stands straight, sticks his right arm out rigidly and opens his right hand wide to signal readiness to vote. His act shifts the balance and leads to the defeat of skinny repeal, the final effort to kill Obamacare. Trump could have learned about leadership and cooperation by paying attention to McCain. While McCain criticizes Obamacare for its problems, he recognizes that it has provided health insurance for more than 20 million Americans. Any change or replacement must be an improvement. Now, Democrats and Republicans in the House of Representatives and Senate, as well as the president, should focus on Plan O fully. In a Kaiser Health poll released July 14, respondents said congressional Republicans should work with Democrats to improve Obamacare, not repeal the law, 71 percent to 23 percent. In a Washington Post-ABC News poll released July 16, respondents preferred Obamacare over the Republican approach 50 percent to 24 percent. Health insurance should cover pre-existing conditions. Health insurance should cover young-adult children on parental plans. Health insurance should cover preventive tests and lab work to detect problems when small and curable. Health insurance should cover emergencies to take substantial cases directly from an emergency room to a hospital room. Health insurance should cover mental care equally with medical care. Health insurance should cover maternity care for mother and child. Health insurance should continue to provide coverage, regardless of total payout, to enable care in cases that are difficult or require long-term treatment. 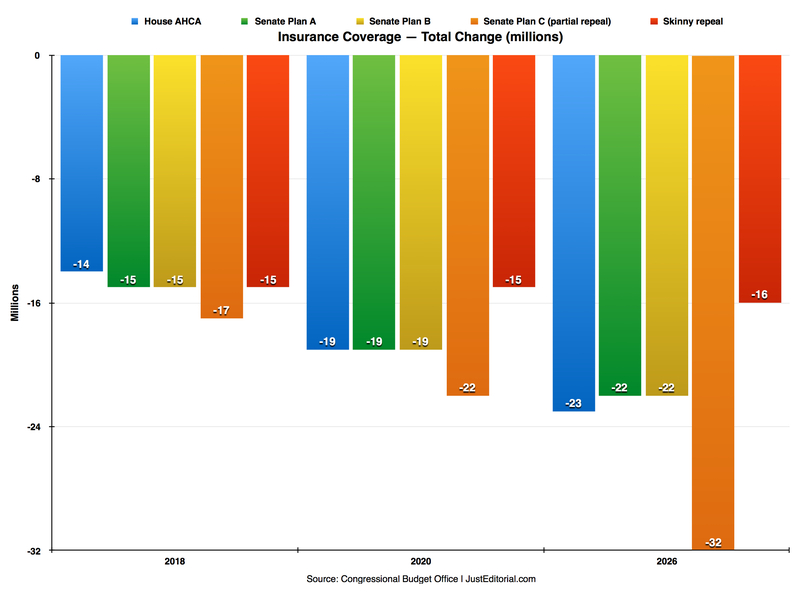 The only plan that provides such meaningful coverage is the Affordable Care Act — Obamacare. Protect and bolster the superior treatment made possible by Plan O. Focus on changes that improve health care for Americans. Ensure that everyone is covered fully. ▽ Download chart — long-press or right-click to save/download. John McCain is the U.S. senator most seriously involved with health care today. He told a series of truths Tuesday that both made predictions and provided guidance for health care deliberations. McCain, R-Ariz., underwent surgery for a blood clot behind his skull and above his left eye on July 14. The Mayo Clinic said July 19 that tests by its doctors found that McCain has an aggressive type of brain cancer. The Senate has not accomplished anything, McCain said Tuesday, and the whole body must work together if it hopes to succeed. President Donald Trump scolded Senate Majority Leader Mitch McConnell and the rest of Republican senators last week for their inability to pass three separate bills. The bills aimed to repeal the Affordable Care Act — Obamacare — and install a weaker replacement. The failed bills became known as Plan A, Plan B and Plan C. They are variations of the Better Care Reconciliation Act, written by Senate Republicans and guided by McConnell. They set out to improve the House of Representatives’ punitive American Health Care Act, passed May 4. The House bill would eliminate health insurance for 14 million people in 2018, compared to present, 19 million in 2020 and 23 million in 2026, estimated the nonpartisan Congressional Budget Office on May 24. McConnell moved the Senate to formal votes this week. Tuesday, with the ABCs piling up, the Senate switched to descriptive names. It defeated a new variation of its bill, known as repeal and replace. The bill included an amendment from Sen. Ted Cruz, R-Texas, to allow low-coverage, low-cost insurance plans that do not meet Obamacare standards for coverage. It failed with 43-57. Wednesday, the Senate voted on partial repeal. The proposal would repeal the bulk of Obamacare after two years, and the Senate would write a new plan in the meantime. The same proposal was called Plan C last week. It would eliminate health insurance for 17 million people in 2018, compared to present, 27 million in 2020 and 32 million in 2026, estimated the CBO on June 19. A majority of senators found none of McConnell’s proposals an improvement over Obamacare. Plan O has brought health insurance to more than 20 million Americans. Thursday, Republican senators tried to repeal Obamacare during a 20-hour debate. Next on the Senate’s schedule is a segment known as vote-a-rama. This period allows any senator to offer amendments to the bill. The amendments could reach into the hundreds. One problem: McConnell has not said which version of the Senate bill will be considered. This helter-skelter is no way to run our government. The Trump-McConnell approach of governance by whiplash is irresponsible. Americans count on the federal government to set up a framework that allows those who cannot get coverage at work to buy insurance with proper terms at an affordable price, or to register for Medicaid. They rely on this coverage not only for health care but, in many cases, for life itself. If all else fails, McConnell plans to introduce a final approach known as skinny repeal. It would repeal the mandate for most people to have health insurance and it would cut several lesser requirements. Skinny repeal would eliminate health insurance for 15 million people in 2018, compared to present, 15 million in 2020 and 16 million in 2026, estimated the CBO on Wednesday. Eliminating the mandate for health insurance would result in many signing up only when they get sick. This would throw insurance-industry finances off balance. It would increase premiums greatly for those who need insurance for ongoing health care — a death spiral. The American Academy of Actuaries warned against this Tuesday. “Eliminating the mandate, by lowering financial penalties or exempting particular categories of individuals from its requirements, would likely have significant implications for health insurance coverage, and costs both to consumers and the federal government,” the academy wrote to Senate leaders. The Blue Cross Blue Shield Association issued a similar warning Wednesday. The Republican House and Senate bills treat Americans with disdain. Their minimalistic approach to health care ignores a fundamental rule of insurance: Plan for the worst. The Republican proposals ignore that wisdom by planning for the routine. Plan O has proved itself as a lifesaver, even though it has some problems. Republicans have blocked improvements and updates to Obamacare since they gained the congressional majority and now the presidency. However, as McCain told the Senate, passion should not overrule reason. Rather than looking for ways to undermine Obamacare, Republicans — along with Democrats — should work to repair and improve this valuable advancement in the American Way. The people understand. In a Washington Post-ABC News poll released July 16, respondents preferred Obamacare over the Republican approach 50 percent to 24 percent. Health insurance should cover pre-existing conditions. Health insurance should cover young-adult children on parental plans. Health insurance should cover preventive tests and lab work to detect problems when small and curable. Health insurance should cover emergencies to take substantial cases directly from an emergency room to a hospital room. Health insurance should cover mental care equally with medical care. Health insurance should cover maternity care for mother and child. Health insurance should continue without a payout cap so a person’s coverage can provide crucial care in cases of illnesses that are difficult or require long-term treatment. Senators should protect and bolster the superior treatment made possible by Plan O. Focus on changes that improve health care for Americans. Make sure that everyone is covered fully. Senate Majority Leader Mitch McConnell and many of his fellow Republican senators told the nation they could improve health care and cut costs by paring down insurance. McConnell said they could cover people with serious illnesses and pre-existing conditions too. Overall, their lightweight insurance proposal saved money by focusing on colds and flu, aches and pains, and other problems that require everyday care by a doctor or nurse practitioner. This minimalism ignored a fundamental rule of insurance: Plan for the worst. McConnell’s proposal did the opposite by planning for the routine. This backward approach would strand patients with difficult diseases. It would cut coverage short for extended hospitalization or long-term treatment. Thankfully, the nation has a plan in place that takes health care seriously — the Affordable Care Act. Better known as Obamacare, it needs some maintenance and upgrades. The reason: A wanton blockade by the Republican Congress and Trump administration has halted updates, routine upkeep and promotion of Obamacare — all in hope of failure. Now is the time for Republicans to invite Democrats to join an equal effort to eliminate inefficient aspects of the program and put better practices in place. However, since Trump’s election, he and congressional Republicans have intensified their attack on Obamacare and, thus, on the health of Americans. Their disregard for the nation’s people continues with a Trump demand for a vote to repeal Obamacare and create a replacement through Senate debate. McConnell says the vote will be next week. The House of Representatives passed the American Health Care Act on May 4. The bill was intended to replace Obamacare. If any Republican group was going to tame the draconian House bill and treat health care sensibly, the national expectation was that it would be the Senate majority — 52 of the 100 senators. The Senate is known for deliberation, experience and caution in comparison to the House. McConnell took the opposite tack. He appointed an all-male, all-Republican group of senators to meet in a series of closed sessions to write the bill. Suspicion spiked. In what would become known as Plan A, McConnell rolled out the Better Care Reconciliation Act on June 22. It split his caucus. Conservatives complained it retained too many Obamacare tenets. Moderates, a number of whom were backed by their state governors, bemoaned stark cuts to Medicaid and other coverage on which many of their constituents rely for health care — and for life itself. Not enough Republicans supported Plan A. No Democrat supported any Obamacare replacement. McConnell rolled out Plan B on July 13. It aimed to pull in more conservative and moderate Republicans alike. Plan B’s lack of support proved the contradiction of its premise. Tuesday, the ever-more-desperate McConnell proposed Plan C. It would have eliminated Obamacare two years from now, with the Senate using the interim to write a new health care bill from scratch. Trump and Vice President Mike Pence stated their support. Plan C collapsed almost as quickly as it was proposed. Wednesday, Trump changed his mind and insisted that Obamacare should both be repealed and replaced — immediately. “We have to stay here. We shouldn’t leave town, and we should hammer this out and get it done — and not just a repeal,” the president told a large group of Republican senators during a White House luncheon. Left unclear by McConnell was which version of the bill would be debated. If the idea gains the 50 votes needed for discussion, a hagglefest will result. With Trump’s influence among senators weakened by limp leadership that includes his erratic proclamations and changes of course, a chance of victory is barely visible. Plan O is a more productive way to go. Grab the toolbox and pound out the dents in Obamacare. Time has identified them, but Republican interference has made repairs impossible until now. The nation prefers Obamacare over the Republican approach 50 percent to 24 percent, says a Washington Post-ABC News poll released Sunday. Democrats have a duty and a need to ensure that Plan O is upgraded effectively and to show the way forward. They passed Obamacare, over Republican opposition, in 2010. Respondents in the Post-ABC poll said the Democratic Party “just stands against Trump” rather than “stands for something” 52 percent to 37 percent. Health insurance should cover pre-existing conditions. Health insurance should cover young-adult children on parental plans. Health insurance should cover preventive tests and lab work to detect problems when small and curable. Health insurance should cover emergencies to take substantial cases directly from an emergency room to a hospital room. Health insurance should cover mental care equally with medical care. Health insurance should cover maternity care for mother and child. Republicans should swallow their party pride and join with Democrats on Plan O. It is the people’s preference 2-to-1. Solve Obamacare’s problems to protect and improve the health of Americans in every state. Fourteen million people would lose health insurance in 2018, compared to present, 19 million in 2020 and 23 million in 2026. Over 10 years, an $834 billion cut to Medicaid would result in 14 million people among those uninsured coming from that program. Premiums would be 20 percent more in 2018, compared to present, and 5 percent more in 2019. The amount in later years is uncertain. The federal deficit would decrease $119 billion over 10 years. Fifteen million people would lose health insurance in 2018, compared to present, 19 million in 2020 and 22 million in 2026. Over 10 years, a $772 billion cut to Medicaid would result in 15 million people among those uninsured coming from that program. Premiums would be 20 percent more in 2018, compared to present and 10 percent more in 2019, but 30 percent less in 2020 and 20 percent less in 2026. The federal deficit would decrease $321 billion over 10 years. Over 10 years, a $756 billion cut to Medicaid would result in 15 million people among those uninsured coming from that program. Premiums would be 20 percent more in 2018, compared to present, and 10 percent more in 2019, but 30 percent less in 2020 and 25 percent less in 2026. The federal deficit would decrease $420 billion over 10 years. Seventeen million people would lose health insurance in 2018, compared to present, 27 million in 2020 and 32 million in 2026. Over 10 years, an $842 billion cut to Medicaid would result in 19 million people among those uninsured coming from that program. Premiums would be 25 percent more in 2018, compared to present, and 50 percent more in 2020 and 100 percent more in 2026. The federal deficit would decrease $473 billion over 10 years. ▽ Download charts — long-press or right-click to save/download. The United States lauds its military members and veterans, only to let them down when it comes to delivering on health care and additional obligations. President Donald Trump promises strong support for the armed forces and veterans. “I pledge my unwavering support for you, for your families and your missions. I will always have your back,” Trump said during a Fourth of July military-appreciation speech on the South Lawn of the White House. A Pentagon recommendation to cancel contracts with thousands of recruits strains that pledge. Defense Secretary Jim Mattis holds the proposal — and the future of legal-immigrant military specialists — in his hands. The armed forces recruited the specialists for their education, ability and knowledge in particular fields, including medicine, language and computer science. In exchange for military service, the recruits were to become U.S. citizens. The Military Accessions Vital to the National Interest program, under which they were promised citizenship for service, has fallen out of favor under the Trump administration. Mattis and Trump should support MAVNI. To do otherwise would make a mockery of the military. Of 4,200 recruits whose status is uncertain, about 1,000 face deportation if the program is revoked. The Pentagon and Trump bureaucracies dawdled, allowing residency permits to lapse. Those permits would have been moot, had the government kept its word to put the recruits in service. The proposal from the Pentagon to Mattis expresses concern over “the potential threat posed by individuals who may have a higher risk of connections to foreign intelligence services,” reports National Public Radio. The Pentagon says this makes the MAVNI program too risky. Trauma surgeon Kusuma Nio was selected to be part of a U.S. Army Reserve deployment to Afghanistan in May, reports Stars and Stripes. Nio’s citizenship ceremony was postponed April 13, with no new date set. Nio said the Citizenship Immigration Services told him the Department of Defense has suspended all such agreements. He was not allowed to ship out with his unit, the 1st Forward Surgical Team of New York. Nio was born in Indonesia. He trained in surgery and earned his doctorate at the University of Minnesota. He lives in Springfield, Illinois. He is trusted and relied upon to carry out civilian emergency-surgery work in a Level 1 trauma center. His medical-trauma abilities match the great need for military surgeons in Afghanistan. Like Nio, Ameya Kulkarni of Pittsburgh drills with the Army Reserve — in his case, the 340th Engineer Company. Kulkarni is a software engineer for an information-management company in the city. He enlisted in March 2016 under a MAVNI agreement, reports the Tribune-Review of Warrendale, Pennsylvania. Progress halted when Kulkarni’s recruiter told him the Army plans to subject him to a counterintelligence review. That is counterintuitive. Kulkarni told the Tribune-Review that he passed a Tier 5 security-clearance investigation. Tier 5 is the top security level. It includes clearance for critical-sensitive, special-sensitive and top-secret material. In 2008, Kulkarni traveled from his native India to study computer science at the University of Florida. He graduated with a master’s degree in 2010 and moved to Pittsburgh in 2015. “I would like to contribute in the field of military intelligence or cybersecurity,” Kulkarni said. The Department of Defense “ordered ‘extreme vetting’ of MAVNIs and told USCIS not to naturalize any MAVNIs until the vetting was complete,” program creator Margaret Stock told the Tribune-Review. USCIS is the U.S. Citizenship and Immigration Services. Stock drew up the MAVNI program in 2007, during the administration of President George W. Bush. She presented it to the Pentagon. Stock ran the program in 2008, under the new administration of President Barack Obama. She did so for a one-year pilot with 1,000 recruits, after which the program reached full status. MAVNI has brought in about 10,400 recruits since 2009. Stock is a retired Army lieutenant colonel and an immigration lawyer in Alaska. She has three degrees from Harvard University and another from the U.S. Army War College. She taught law at the U.S. Military Academy at West Point. Mattis, the defense secretary who is a retired Marine general, must know that the history of incorporating noncitizens into the armed forces goes back to the nation’s first days. In World War I, 20 percent of those in the military were noncitizens. Security make sense, but not to the point of casting one’s feet in concrete. Consider that citizens and holders of green cards — noncitizens who are classified as permanent residents — can serve in the armed forces without any of the scrutiny proposed for the MAVNI recruits. Mattis should follow his training and experience. Trump should keep his promise to back up the military. They should continue the Military Accessions Vital to the National Interest program, with a workable level of security investigation. Any opposing decision would dishonor the military and the nation. Gen. Joseph Dunford, chairman of the Joint Chiefs of Staff. Our most destructive weapon is the nuclear bomb. Rigorous procedures for care and storage make the complicated weapon difficult to maintain safely. To protect the nation and set an example for the world, the United States should publicize safety records for nuclear weapons. It should do so as the inventor of the atomic bomb, as the leader in weaponry and to set a verifiable safety standard for the few countries that have nuclear bombs. The Pentagon has done the opposite. In March, the office of Gen. Joseph Dunford, chairman of the Joint Chiefs of Staff, issued an instruction to classify the results of nuclear inspections, The Associated Press reported Tuesday. The new policy will make certain that “as long as nuclear weapons exist, the U.S. will maintain a safe, secure and effective nuclear stockpile,” said the Joint Chiefs’ spokesman, Navy Capt. Greg Hicks. Nonsense. With the people of the U.S. blocked from knowledge of the military’s nuclear-safety performance, they will have no facts — no leverage — to use when imploring their representatives, senators and president to protect them from dangerous stockpile practices. History shows the need for keeping the public’s eye on nuclear-weapon safety. In 1980, a Titan II intercontinental ballistic missile exploded in its underground silo outside of rural Damascus, Arkansas. A crew member working on the missile dropped an eight-pound socket for a wrench. It fell 80 feet before hitting the missile’s fuel tank and puncturing it. Fuel spewed in an incendiary cloud of vapor. Poor communication and disjointed decision-making delayed repair efforts. The missile exploded 8½ hours later. Its 9 megaton nuclear warhead flew 600 feet and landed 100 feet from the compound’s gate. One Air Force member was killed and 21 were injured. In 1978, a large cloud of toxic oxidizer escaped the same silo and drifted over U.S. Highway 65. In 2011 at Los Alamos National Laboratory in New Mexico, a promotional effort broke one of the cardinal rules of nuclear safety. Los Alamos Lab created the atomic bomb and the hydrogen bomb. Despite that history and the deep knowledge of many at the lab, technicians lined up eight plutonium rods side-by-side for a photograph. Such rods must always be kept apart to avoid spontaneous fission that can result in a lethal flash of radiation. Thankfully, a supervisor stumbled across the photo shoot and put a stop to it. However, the manner in which the display was dismantled increased the danger. The lab halted its handling of plutonium in 2013 to retrain its workers on safety standards. In June, Los Alamos Lab shipped weapon-related nuclear material to California and South Carolina by air transport, reported the National Nuclear Safety Administration. Such shipments should be sent by ground transport to avoid loss of containment. In 1994, an Army depot in California sent plutonium to the lab by FedEx air shipment. In 2005, a FedEx package sent by a Los Alamos Lab researcher to a Pennsylvania lab resulted in radioactive contamination from the americium within. Many reports about nuclear-weapon materiel not under military control remain open to the public because of oversight by separate governmental agencies. The Pentagon should understand that forthright safety information benefits the public and leads to improved security. Many more examples of dangerous circumstances at nuclear-weapon stockpiles and laboratories have been documented. The Pentagon’s secrecy effort will blind the public to future risks. In 2014, problems with nuclear-weapon safety led Hagel to order an independent study to find solutions. Despite Hagel’s warnings against secrecy, the new policy classifying safety results has a connection to the study he commissioned. In conjunction with the study, the Pentagon recommended in 2014 that the Air Force “adopt the Navy’s policy” of classifying the results of nuclear-weapon inspections, said Hicks, the Joint Chief’s spokesman. Besides Hagel, who commented on governmental secrecy generally, the AP spoke with an independent expert. The Pentagon knows that classifying the results of nuclear-weapon-safety evaluations protects no information of value from enemies. It only averts the eyes of those it serves: the people of the United States. In military parlance, this is a CYA maneuver. Joint Chiefs Chairman Dunford should order all military nuclear-weapon-safety results to be made public.